Zuni dinosaur fetish carvings are non-traditional and relatively rare to come by. They do not hold any traditional meaning, however, they do make excellent and amusing additions to any Zuni fetish collection. We acquire Zuni dinosaur fetish carvings from time to time. 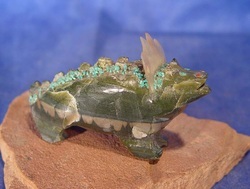 Please visit our Online Catalog here to view and purchase any available Zuni dinosaur fetishes at this time.